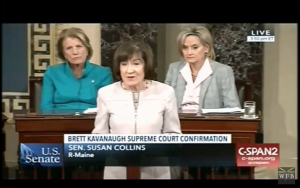 Sen. Susan Collins (R., Maine) on Friday announced that she will vote to confirm Supreme Court nominee Brett Kavanaugh. "Despite the turbulent, bitter fight surrounding his nomination, my fervent hope is that Brett Kavanaugh will work to lessen the divisions in the Supreme Court so that we have far fewer 5-4 decisions and so that public confidence in our judiciary and our highest court is restored," Collins said on the Senate floor. "Mr. president, I will vote to confirm Judge Kavanaugh." Collins, who had been the last undecided Republican vote on Kavanaugh's confirmation, discussed Kavanaugh's judicial record and argued that he would not make judgments opposed to the views of her constituents. She argued that Kavanaugh would uphold the Affordable Care Act's protection for people with preexisting conditions and condemned interest groups who "have speculated that Judge Kavanaugh was selected to do the bidding of conservative ideologues despite his record of judicial independence." The Maine Republican said that Kavanaugh's record reflects that of Merrick Garland, whom former President Barack Obama nominated to the Supreme Court in 2016. "That Judge Kavanaugh is more of a centrist than some of his critics maintain is reflected in the fact that he and Chief Judge Merrick Garland voted the same way in 93 percent of the cases that they heard together," Collins said. "Indeed, Chief Judge Garland joined in more than 96 percent of the majority opinions authored by Judge Kavanaugh, dissenting only once." Regarding the allegations of sexual misconduct against Kavanaugh, Collins argued that the judge deserves the presumption of innocence. Certain fundamental legal principles about due process, the presumption of innocence, and fairness do bear on my thinking, and I cannot abandon them. In evaluating any given claim of misconduct, we will be ill served in the long run if we abandon the presumption of innocence and fairness, tempting though it may be. We must always remember that it is when passions are most inflamed that fairness is most in jeopardy. The presumption of innocence is relevant to the advice and consent function when an accusation departs from a nominee's otherwise exemplary record. I worry that departing from this presumption could lead to a lack of public faith in the judiciary and would be hugely damaging to the confirmation process moving forward. Collins said that the allegations against Kavanaugh did not meet a standard of "more likely than not," adding that they could not fairly be used to prevent him from being confirmed. "This is not a criminal trial, and I do not believe that the claims such as these need to be proved beyond a reasonable doubt," Collins said. "Nevertheless, fairness would dictate that the claims at least should meet a threshold of more likely than not as our standard." "The facts presented do not mean that Professor [Christine Blasey] Ford was not sexually assaulted that night or at some other time," Collins continued, "but they do lead me to conclude that the allegations fail to meet the more likely than not standard. Therefore, I do not believe that these charges can fairly prevent Judge Kavanaugh from serving on the court."